Despite some application performance issues, one expert believes SuccessFactors HCM is one of the strongest offerings in the HR tech market. The SuccessFactors HCM suite is SAP's cloud human capital management (HCM) offering, which covers the entire hire-to-retire process. The suite's foundation is Employee Central, a modern human resources information system (HRIS), which includes extensibility options for customers to extend the system with their own objects, business rules and applications. SuccessFactors provides a set of talent management applications to cover performance and goal management, compensation, enterprise learning, succession planning, career development, recruiting and onboarding. The suite also contains Workforce Analytics -- a vendor-agnostic in-depth analytics and reporting system -- and Workforce Planning. All of this is supported by SuccessFactors Mobile for Android, Apple and BlackBerry devices. The Home Page, Public Profile, Employee Profile, Org Chart, Job Profile Builder and Metadata Framework (MDF) are platform features available to every customer, regardless of which modules are used. The May 2014 (1405) release includes enhancements to MDF and the homepage To-Do tile, as well as new functionality to enable Position Profiles to be constructed in Job Profile Builder. SuccessFactors' mobile app for Apple devices also got a makeover in this release with a fresh design. Key features of Employee Central focus on globalization, employee file management, workflows, self-service and new Global Benefits functionality and extensibility. The latest release sees additional country localizations, a new Employee Central Service Center application built on the SAP HANA Cloud Platform (available for an additional fee) and new data retention and purge functionality. With regard to talent applications, SuccessFactors now features a Team Rater for 360-degree performance reviews, decentralized compensation management administration, the ability to make or change Succession nominations in the Employee Profile and a manager dashboard for Career Development Planning worksheets. Workforce Analytics comes with over 2,000 pre-delivered analytics and comprehensive analytical capabilities, including dashboards, reports, key performance indicators matrices and predictive functionality. As of May 2014, the product features streamlined administration options, enhancements to the Ad-Hoc Report Builder and a new tile-based Dashboard framework that allows administrators to build their own analytics tiles and incorporate them into dashboards. SuccessFactors is regarded as a leading talent management suite by a variety of industry analyst firms. From my perspective, many of the features found in SuccessFactors' flagship applications such as Performance & Goals and Learning are more innovative than features found in competitor systems, although they are not all entirely unique. In particular, features such as Writing Assistant and Coaching Advisor reduce the effort of end users. Usability is a strong point of the SuccessFactors HCM suite and is a world apart from most on-premises HRISes. Mobile functionality is included at no extra cost. 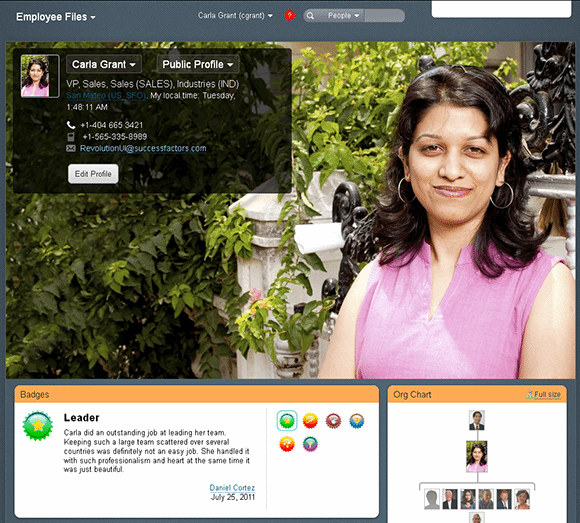 Employee Central is one of the fastest-evolving core HRIS systems on the market. Globalization and extensibility are core strengths of Employee Central, as is pre-packaged integration content available with the Dell Boomi AtomSphere middleware. Unlike other core HR systems on the market, Employee Central's Metadata Framework enables users to create objects that behave in the system like standard objects. Further, the extension package on the SAP HANA Cloud Platform allows customers to create custom applications to run within the Employee Central system. 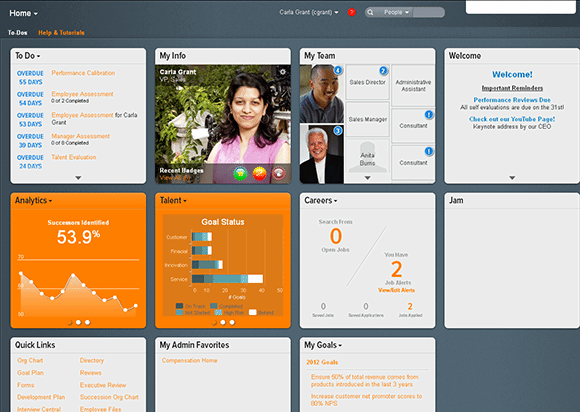 Personally, I believe the most impressive features of SuccessFactors are the Home Page Tiles, the new Development Plan form, the recently introduced Presentations application, and overall configurability and extensibility of the system. I particularly like Presentations, which provides customers with the ability to quickly create interactive presentations with live customer data, and the Metadata Framework. However, there are some areas in which the product could stand to improve. At present, SuccessFactors HCM does not support concurrent employment, although this capability is due to be rolled out in fall 2014. Customers who are considering SuccessFactors Learning should bear in mind that the iContent content server system can be quite costly for some organizations. Also, at the current time, customers must use an implementation partner to deploy SuccessFactors. In my opinion, the overall search functionality requires some additional criteria to make it easier to find groups of employees. Also, it can be tricky to transfer compensation data from Employee Central to Compensation, depending on the customer's compensation design. Some configuration options are still only possible from partners or SuccessFactors Professional Services, although this is being reduced with each release. Application performance is at times an issue for customers, but this should be resolved with the impending transition of SuccessFactors onto SAP HANA. In terms of Employee Central, reporting is not as flexible as with some competitors, but the capabilities are enhanced if Workforce Analytics is used in conjunction with the system. Lastly, the system needs deeper mobile functionality, particularly for Android devices. SuccessFactors' customers vary in size, geographical location and industry, and the platform has been proven to support customers with hundreds of thousands of employees. Generally, most organizations that don't currently have talent management technology or are using older, on-premises applications will get a leg up from SuccessFactors. As for Workforce Analytics, organizations with a significant investment in a business intelligence or analytics platform might want to investigate extending the use of their existing system before purchasing a Workforce Analytics subscription. SuccessFactors HCM is licensed on a subscription basis per-user-per-year. There are many factors that can potentially affect the cost of a subscription, and therefore, it can be hard to provide ranges. Many SAP customers receive discounts on the list price and can also use SAP's license swap program to apply a portion of their maintenance payments to a SuccessFactors subscription. Luke Marson is a principal consultant and director of cloud HCM and related technologies at an IT consulting firm, where he focuses on SuccessFactors Employee Central and extensibility and integration technologies. He speaks and writes about SAP HCM and SuccessFactors extensively, co-authored the SAP Press title SuccessFactors with SAP ERP HCM and wrote the SAPexperts Special Report SAP and SuccessFactors -- An Overview. Marson is also an SAP Mentor. What do you think are SuccessFactors' greatest strengths and weaknesses?